Mix all ingredients. Pour over roast. Marinate in refrigerator for 8-24 hrs. Drain & reserve marinade. 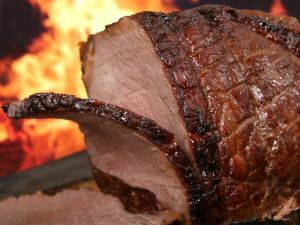 Roast at 350’ for 2 ½ hrs. Baste with marinade frequently during last ½ hr. Enjoy! Place steak in a glass or ceramic pan. Score top of steak with a sharp knife in a criss-cross pattern to allow marinade to penetrate. Whisk together all ingredients except tarragon. Pour marinade over steak. Sprinkle tarragon over top. Cover and marinate in fridge 2 hrs to over night. Remove steak, season with salt & pepper. Discard marinade. Cook over med-high grill. Enjoy! Thinly slice or pound chicken. Sprinkle with salt, pepper and thyme. Drizzle pan with olive oil and brown chicken on both sides. Remove to a warm dish. Using the same pan add mushrooms and enough chicken broth to saute’ until tender. Add Molicious Mustard and remaining broth. Stir to blend. Add whipping cream. Heat to desired thickness. Enjoy. Quick, easy and delicious! If there’s a buzzword these days, it’s “house-made.” With so many from-scratch items to choose from, it’s difficult to know which are worth seeking out. Here are our staples—which can be found on the shelf and on restaurant menus.